Current Demands, Inc. provides reliable residential and commercial electrical services throughout metro Atlanta, Georgia. We work on any type of electrical project, from troubleshooting and repair, to electrical system upgrades and new electrical installations including popular low voltage systems. Call us whenever you, or your business, needs an Atlanta electrician. Since our start in 2002, our mission has been to provide our clients with top quality electrical service done safely, efficiently and at a competitive price. 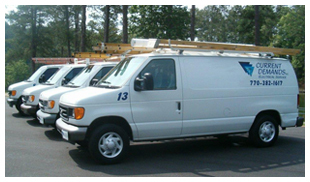 We are fully licensed and insured, with certified electricians serving all of metro Atlanta. Every electrician that works for our company is a trained professional. Every day we provide residential electrician services to solve problems and improve our customers' homes. Our residential electrical services may be as simple as wiring a ceiling fan, fixture or wide screen television, to installing recessed lighting, computer networks or low voltage systems. We have very affordable rates for our residential electrician services. Every service call is done with an eye on keeping our work area neat. Call us now! As a commercial electric contractors we understand the importance of keeping your business operating. We provide 24/7 emergency electrical repair services, new electrical installations, electrical upgrades, and general electrical needs such as wiring, lighting, communications wiring, and fiber optic cabling. Our certified electricians can work after normal business hours to minimize disruptions to your business. Whether you have an office, store, clinic or restaurant we are a reliable electric contractors with the experienced certified electricians you need. We are highly capable industrial electrical contractors who can safely and properly handle any project requiring an experienced industrial electrical contractor. From system troubleshooting of basic wiring or lighting to the wiring of equipment, VFD drives, or installing backup power generators a certified electrician will safely complete your electrical project. We practice total job site safety including practices such as lock-out-tag-out and every Atlanta electrician we send will have proper PPE items. We provide electrical contractor services for numerous specialty jobs including installing emergency power generators, security cameras, low voltage outdoor lighting or power gate controls, controlled access systems and more. We can serve as a consultant for electrical system design including sourcing the most reliable and affordable electrical equipment. Our electrical contractor services can get your job done properly, on-time and within budget. Simply put we are a great choice when you need an Atlanta electrician for a small job or you have a major project requiring skilled electrical contractors. Contact us whenever you need a reliable Atlanta electrician.